If you don't run in the same circles that I do, then you may have missed this blip on the news. Indeed, the Devil (or at the very least a high ranking minion) was recently recorded doing, well ...the devil's work, in a hidden camera video. Okay, I overstated the case a bit when I called Deborah Nucatola (from the above video) Satan. I'll stand by the high ranking minion description though. In a strange turn of events another high ranking minion was also recently caught on video discussing the sale of dead murdered baby parts. If you can hold down your lunch long enough to get to the end of this video, you may catch Mary Gatter quipping that she wants a Lamborghini; a clear allusion to the profit she can see in the modern day equivalent of grave robbery. I have to say, Dr. Frankenstein from the tale by Shelley was a far more sympathetic figure; of course that story does not begin to earn the adjective "horror" when put beside the murderous history of Planned Parenthood. Cecile Richards may not be the devil incarnate, but it is plain whose daughter she is. BUT, wicked as all of this is, the lesson we might learn from the small amount of outrage generated is how depraved our once great nation has become. A few people may become upset over the ghoulish sale of dead baby body parts, but have they forgotten the millions of babies murdered in the years since the Supreme Court instituted a constitutional right to commit that murder? You serious Clark? What is the greater sin? The murder or the sale of the corpse? May God have mercy on us, though we surely deserve none. But in this case it is a good thing. 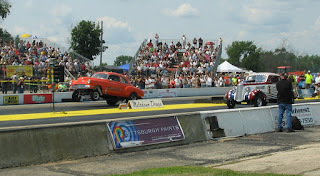 On July 17, 18 and 19 Byron Dragway will be the scene of the 6th annual Meltdown Drags. This event is one that you really need to attend to gain a full appreciation for the concept. 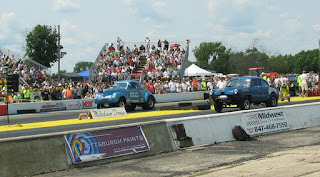 From the grandstands you will think you stepped back in time to a 1966 drag race! 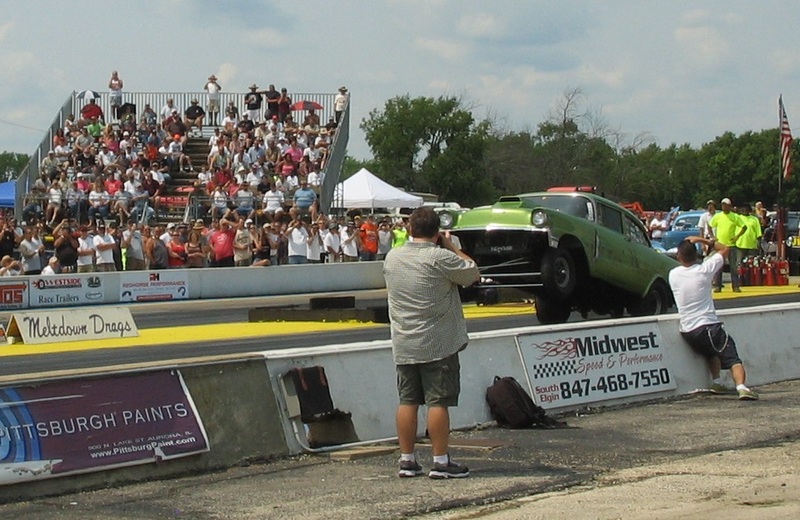 Every year this beautiful dragstrip outside of Byron Illinois (near Rockford) becomes home to a weekend that reminds us why drag racing became such a popular sport during the '50s, '60s and beyond. What make this particular event such a hit is a combination of things. For one thing, all the vehicles must be 1966 or older. Add to that, they need to be period correct as viewed from the stands. That means no modern wheels or "snorkel" hood scoops. Another key ingredient might be that the Meltdown Drags Crew has chosen to curb the natural inclination of racers everywhere to go faster and faster (translation: spend more and more money) by making it a "grudge racing" only event. If you're not familiar with the term "grudge racing" it basically comes down to this: no trophies or even class eliminations -for every pass down the strip each racer is free to pair up with another similar vehicle that will provide for a good race. 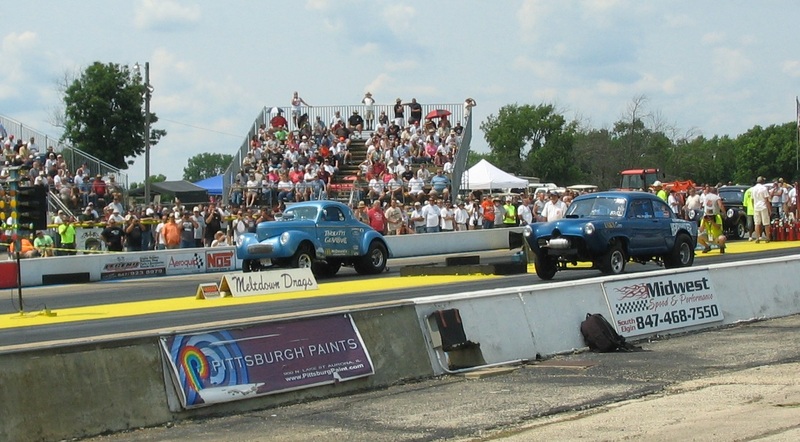 This event draws in the neighborhood of 500 competition vehicles which includes everything from front engine dragsters to near stock looking sedans. And gassers. Lots and lots of wheel standing gassers. Of course a 1966 drag race scene would not be complete without motorcycles, and the Meltdown Drags, true to its theme, includes them. Last year's event included somewhere in the neighborhood of 20 motorcycles in competition. I suspect that may be near the ratio of cars to bikes that one might have found at a typical mid '60s drag race. 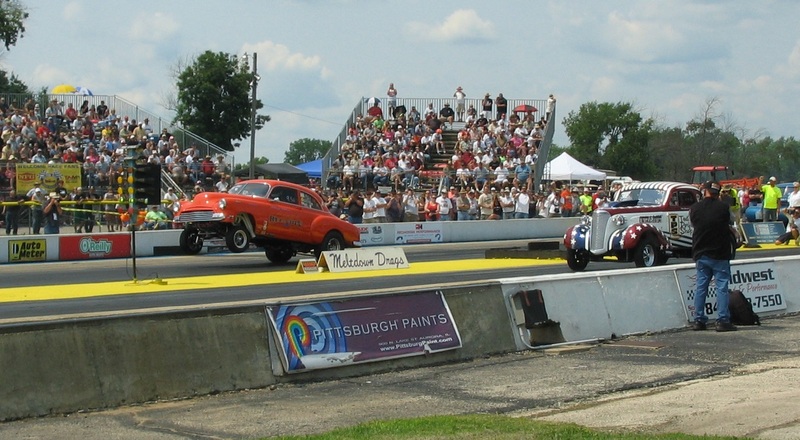 Rumor has it that this year we can expect to see Glen Kerr with his famous world's first twin engine dragbike, Dubble Trubble. The boys from the AH Garage will likely be there with vintage Harleys ranging from a Knucklehead to a Shovelhead and pretty much everything in between. Steve McGregor with his double engine Triumph may be there, not to mention Wayne Skinner and his single engine Triumph dragster as he continues to up the percentage of nitro. 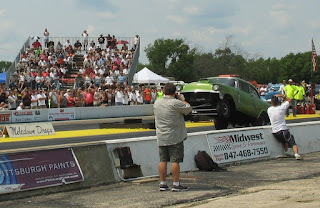 Last I heard, John Endrizzi plans to run his supercharged street Knuckle, and I fully expect Jay from Fear No Evo Racing to show up with his Iron XL gasser. No doubt there will be other bikes there as well, filling out the program. As for the Knuckledragger, Lord willing we will put in an appearance with it. I am finishing up a 4 speed transmission for it (built from mostly used parts) because the 2 speed was not really the hot set up combined with a modern slick without nitro: pretty hard on clutch plates. 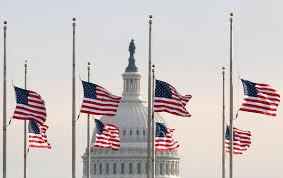 I have to admit that this 4th of July seems more like a funeral than a birthday celebration. You know how modern day funerals all seem to want to be called "a celebration of the life of ________" (fill in the blank). Eventually that may be how many of us look at the 4th of July; as a celebration of the deceased's life. Just as when we attend a funeral and look back on the life of a friend, we tend to recall the good they did while holding our tongue about the times they fell short. If that friend was a God fearing man (in the biblical sense) then there is indeed reason for hope regarding their future state. But what if your friend had spent a good portion of his life professing to love God (despite an ongoing struggle between doing good and doing evil, as we all have) only to totally reject God in his later years; celebrating what the LORD condemns? Not so much hope left for that friend's future. ...but that would not completely erase the affection you once had for him. That sort of sums up how I feel about the 4th of July funeral celebration this year. One thing is certain though, if we did have a flagpole, Old Glory would only be ascending half way this 4th of July. Think of it as paying respect to a fallen hero.